I was warned by people who’ve been previously that China’s very different in terms of culture, so I knew I’d need to keep an open mind before travelling there. I want to share with you the tips and tricks I picked up on my travels as well as some lessons learned based on my experiences. And trust me, you need to know these. I’m not trying to shine a bad light on China, because I really did love it; these tips are just to make your trip even better, if you are planning on going there. Enjoy! I’ve written 4 blog posts on our trip to China and made 2 videos; I know, but I had a lot of information to share. In saying that, if I had to just give one tip, it would be to get yourself a tour guide. First of all, nobody speaks English. I mean NO ENGLISH. Not even the basics like hello, goodbye, thank you. All of the writing is in Chinese including the menus. Also, if you got sick, nobody would understand you and any way, there is no such thing as medication over there, they only sell herbal treatments. The way you approach long haul flights is the difference between having jetleg and not! We stupidly didn’t sleep on the flight over. Instead we slept when we got to the hotel in Beijing and we paid the ultimate price. It took us at least 5 days to shake the exhaustion! Travel Tip: You need to switch timezone’s straight away! We shouldn’t have slept when we landed in China. Rather, we should have sucked it up and stayed awake until the night time. It would have only taken us a day or 2 to adapt. China is many things, but it is far from glamourous (Hong Kong aside, perhaps). Here are my thoughts. We were up at 6am most mornings, the days were jammed packed with activities and we were home late most evenings. The humidity was like nothing I’d experienced before and the heat…! My point is that having lovely hair and make up is not going to happen! The Toofaced Sweet Peach Palette (read about that here). The Wet & Wild highlighter in shade “Crown in my Canapy”: because I use it as a bronzer, highlighter, blusher and eyeshadow all in one. The Garnier BB Balm: great coverage and long lasting. Mascara: currently loving the L’Oreal Paradise mascara. Travel tip: When it comes to makeup, just bring the basics! My skin is so needy it’s ridiculous so I did continue with a good skincare routine. China is heavily polluted (more on this below) so you really need to wear moisturiser, day and night, to protect it. Naturally, you will need an SPF. I’ll be writing a post on my current skincare routine soon, so be sure to subscribe for email notifications below. Travel Tip: With the space you’re saving on makeup, bring more skincare products. Between the environment and all the Chinese food, your skin will need some TLC. This was the hardest part of the journey for me. The sanitation and hygiene in China are beyond low… and I’m being polite! The toilets are filthy. They’re fine in your hotel, they’re “westernised” but once you’re outside, the standards drop significantly. The toilets are squat toilets… I’m guessing you know what that means? That’s the first thing. The second is that they are absolutely filthy. Imagine the toilets in a nightclub at the end of a night, then multiple it by 100. I am not exaggerating. There’s rarely toilet paper or a place to wash your hands, so Waterwipes and Hand Sanitizer are a must have! Travel Tip: Another tip, NEVER eat the street food. We heard some horror stories. There are so many amazing restaurants with cheap prices, it is not worth risking your health. We were told to buy backpacks because they would be more convenient since we were going to be moving around so much. They absolutely were not convenient, quite the opposite really. We packed really lightly and still they were so heavy and so uncomfortable, probably even more so because of the humidity and all of the travelling. Travel Tip: Bring a suitcase! I have to be honest, I did not know this until the week that I was travelling to China! I had mentioned on my Snapchat (livelavishlycom) that I would be snapping when I’m over there, only to be told that it wouldn’t be possible! As I always say, where there’s a will there’s a way! If you download a VPN, you can trick your phone into thinking it’s in another country i.e. not in China. We downloaded VPN Express for €12 for a month and it worked perfectly. Please be sure to go to settings when signing up and turn off auto-renewal or you’ll be entered into another contract. Imagine being stuck on a train! Well that’s what we had to do. We had 2 overnight trains on our journey. The first was for 14 hours and the second was for 19 hours! 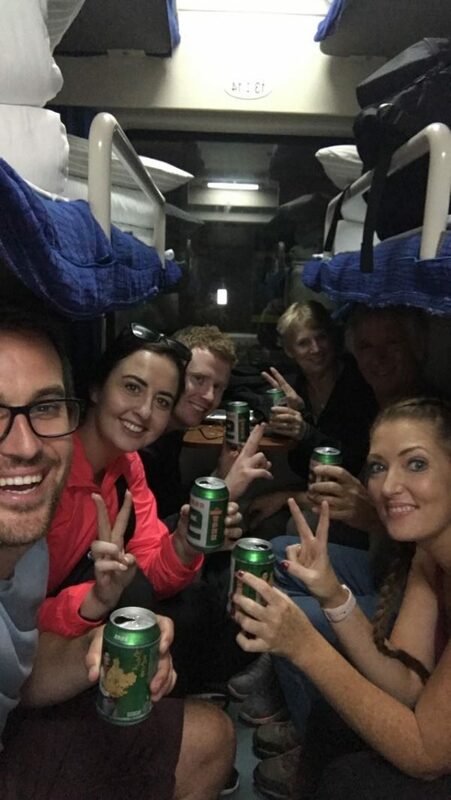 We had a ball on the first train with all of our new friends, we played cards, ate junk food, drank beer and laughed. By the time we woke up the next morning we had arrived. The second train was horrible. 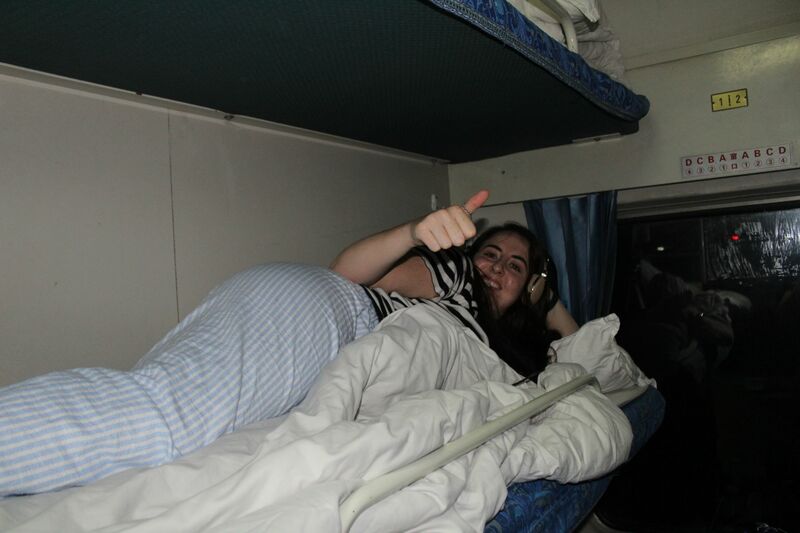 We were sleeping in a bunk right at the carriage entrance and although there was supposed to be no smoking, the guards on the train smoked all night! They were so loud too and we were right by the toilet so the smell was dire! We barely slept and were exhausted the next day. 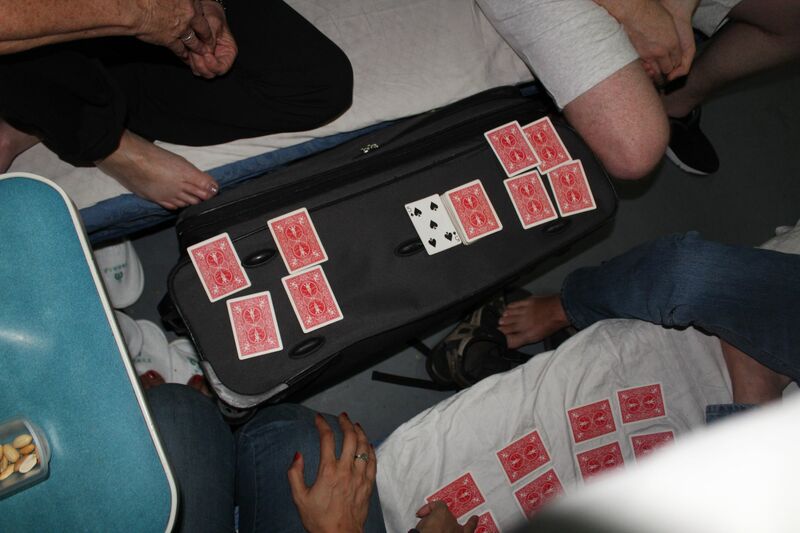 The train didn’t even have a table for our cards! 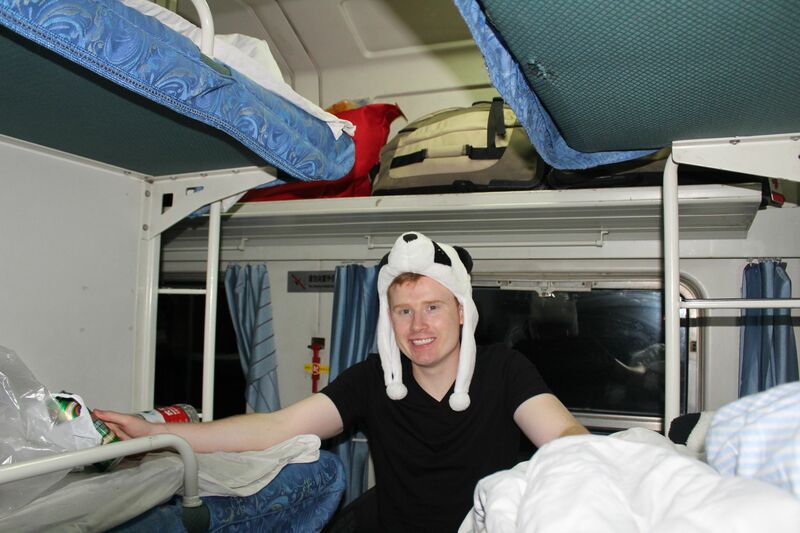 Although I did have a real life panda to keep me company. This one is hard to explain. The best way I can describe China is that it is like another world; in every way possible. Another thing that I found really strange is that you are considered rude if you clean your table after you eat. Cleaning tables is somebody’s job so they don’t take it too lightly if there is any sort of threat to that. Another example of this is that when we arrived to Longji, there were women that wanted to carry our bags up the mountain. These women were a lot smaller and older than me but it was considered rude if we didn’t let them carry our bags because that’s the only way that they make money. It wasn’t only a culture shock for us but for some of the residents too! When we visited Yangzhou, people were pointing, laughing and taking pictures of us! You can see some of these examples on my China vlog which you can watch in this post here. 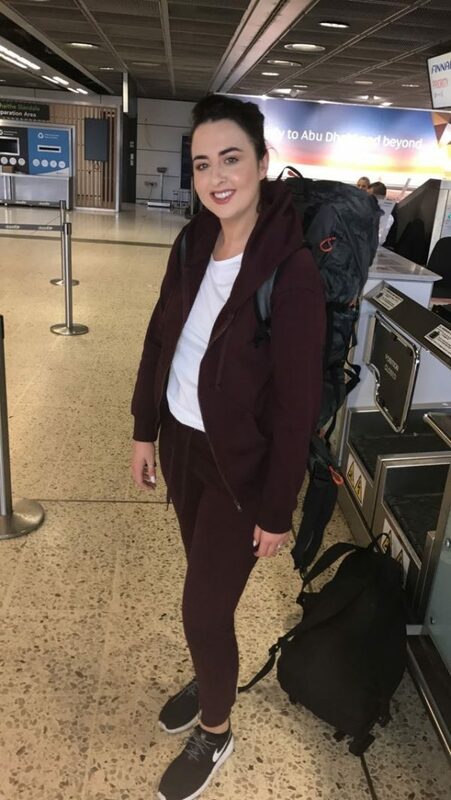 Travel Tip: Again, I wouldn’t travel without a tour guide and also, make sure you have your own little first aid kit with out. Again, I had heard before that China is heavily polluted but it still shocked me just how much and I got really sick because of the pollution! When we first arrived, I thought it was overcast but no, the sun was hidden behind clouds of pollution! You will have seen pictures of people in China wearing face masks. Don’t laugh, but I thought that was to protect them against diseases like the Bird Flu and SARS! No, it’s to protect their lungs from the pollution and I ended up wearing one when we were staying in the big cities. From the first day in Beijing, until we got to the countryside, myself and Darren had pollution sickness (cold/flu like symptoms). The pollution is the reason why so many people hock and spit too! I thought people were just being disgusting but that’s the way they clear their lungs (I still think it can be avoided in public though). Travel Tip: Bring some Vicks Nasal Spray and whatever else you would take for a cold or flu. Also, wear the face masks in the big cities. The below picture is a screenshot from my Snapchat (livelavishlycom). Please, please, please do not let this turn you off going to China. I just wanted you to prepare for it. You will see from my other blog posts and my videos that China is amazing and so beautiful. You can read about all the good parts here.